While high-end antique and collectibles dealers maintain a strong presence at the show, in the past few decades Brimfield has also become a mecca for stylists and designers of all kinds: Interior designers, set designers, costume and fashion designers, visual merchandisers, wedding and event planners, food and restaurant stylists, furniture and textile designers. You can find them all walking the fields. Sometimes they're filling entire shipping containers to furnish a flagship store or trendy restaurant. Sometimes they're buying specific pieces as props for a period movie or television set. Sometimes they're just taking photos and jotting down notes. We have met people with the most interesting careers and interests in Brimfield and that never gets old! The mix of people from all walks of life and all over the world is one of our favorite parts of the show. Everyone is thrown in it together and we like to describe it all as "beautiful chaos." We honestly love hearing everyone's stories about Brimfield and would love to hear yours! What does Brimfield mean to you? How long have you been attending? Why do you come year after year? Is your interest in the show personal or professional? What's your favorite Brimfield memory? What will you be looking for this year? And while everyone is looking forward to a strong 2016 show season, let's take a look back at how much fun we had in 2015! As always, dealers had mixed experiences at the September Brimfield show. A few said it was their worst show in years. A few had great shows. As usual, most fell somewhere in the middle and many acknowledged that their expectations were thrown off by such uncharacteristically strong July sales. The sweltering heat can also slow things down and it was really hot the first few days of the show. You expect that in July, but September is usually a bit more comfortable. The weather later in the week was great, but a threat of rain may have kept people away on Friday and Sunday. But the shoppers who are there never seem disappointed. Whether they are veteran buyers or a first-timer just taking it all in, people are generally happy to be there. As far as the app is concerned, the September show was a big success for us. We had a lot of momentum heading into the show and a lot of things came together giving us a strong finish to the year. Our recent partnership with Brimfield.com lead to a big increase in site traffic and downloads in the two weeks leading up the show. The site is one of the leading sources of online information on the show and their FAQ section is now chock full of information about the app. We are so appreciative of this exposure. It's good for us, good for dealers and good for the show attendees! "We have a Smartphone APP that can be downloaded before heading out to the shows that can help you locate specific items, and it's all coordinated with a GPS that can direct you right to a dealer you might be looking for..."
We also experienced a bump in dealers signing up to be listed and our strong download numbers continued through the entire show. The combination of exposure from Brimfield.com, the news article, our distribution of signs throughout the show fields, our prominent locations at New England Motel and Central Park and a larger social media presence resulted in the highest number of downloads for any show so far. Saturday of the show we broke our all time daily record with 368 downloads! A strong finish to the 2015 season brings total downloads (Android and iPhone) to just over 8,500 and 23,000 individual searches for specific items/categories/dealers. The app is definitely being used by shoppers and more and more people are learning about it at each show! We always have fun at the show, but it's particularly satisfying to receive so much positive feedback from dealers and users. So many users came up to us at the camper to tell us that they loved using the app and it helped them find what they were looking for or gave them ideas of specific dealers they wanted to find. And many dealers told us that people found them using the app and made big purchases. Dealers are definitely starting to realize how effective the app is. One of my favorite stories from the show happened on Tuesday. A well-established vintage textile dealer at New England Motel ran up to us saying she NEEDED to be in the app. She told us two customers had called her earlier in the week and asked her why she wasn't doing Brimfield. They thought she wasn't going to be there because she wasn't in the app. That's a huge win for us! Later in the week we followed up with her and she said that a few people had mentioned finding her because of the app. She enthusiastically signed up for all three shows next year! Social media continued to play a huge part in our success throughout the entire year. We use a combination of Facebook, Twitter, Instagram, Pinterest and this blog to help promote Brimfield as a whole, the app and our individual dealers. We saw a steady increase in Facebook followers during this show but our biggest increase was Instagram. We started the May 2015 show with 500 followers and we currently have 2,400! Ideally, this user would have found out about the app prior to the show. But next year she will have it from the get go and will be able to find the dealers she is looking for. It's also a perfect example of why we urge dealers to mention the app in their social media posts. Sometimes giving your field name and site number isn't enough because so many attendees don't know where one field ends and another begins. If I was a dealer, I would want customers to be able to find me easily and (even more importantly) BEFORE they spent their money at other booths while they were searching for me. We even had app users tell us they chose which field to park on by looking at the app and which field had the dealers they were most interested in. We've said from the beginning that we would give this little business our best effort for six shows. The September 2015 show was our sixth. It hasn't gone exactly as we expected or hoped but it has been an interesting and fun challenge. We have learned so much, worked so hard and we are more excited than ever at the potential it has. We seem to be approaching a tipping point where dealers and shoppers accept the app as part of the new normal way to do Brimfield. And while we are looking forward to a few months of "downtime," we are fondly looking back on #brimfield2015 and really excited about what #brimfield2016 will bring. We have exciting changes and features planned for our website and the app which we will fill everyone in on early next year. In the meantime, thank you so much to each and every person that played a part in our success this year. An extra special thank you to our close family and friends that help us survive those crazy weeks. We couldn't do it with out you. 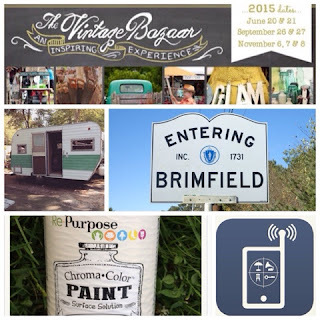 As we look back on #brimfield2015, I'm feeling nostalgic already. Our Brimfield family has expanded to include so many new people we may never have met otherwise. Being around so many hard working creative people has been inspiring and fun for us and our girls. And as challenging as having two little people there can be sometimes, I love how it exposes them to new food, new people and new (old?) objects that spark the best conversations. Brimfield always has and always will hold a special place in our hearts. Now it's even more special to us and we can't wait to be back there in May! P.S. For more photos of the show, please view our September 2015 Album on Facebook. If you are a dealer and see your booth please tag yourself as Facebook doesn't let me tag pages consistently.